The result is a topographic variety of landscapes and very rich reliefs. The plain, located between the Tarn and the Garonne, as well as in the valley of Aveyron (from its mouth to Montricoux) contrasts with the hills of Lomagne and the north of the department. The East Tarn-et-Garonne is a limestone plateau, a causse where we practice mostly breeding. 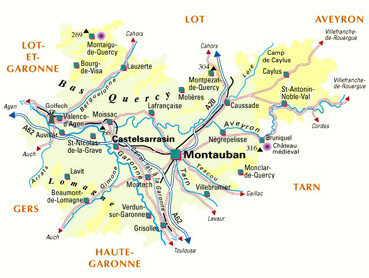 The central position of Montauban and the important road and rail network offer the advantage of being able to visit many tourist sites located in neighboring departments during day trips. While enjoying the peace and the private space the situation of our lodging allows to reach the city center in 7 minutes, the commercial zones in 4 minutes and the ring road in 3 minutes. Our "good addresses" are also nearby. We will offer tours according to your interests and provide you with important tourist information.